Not to mention random trips to far-off places like New Jersey and Queens. So it's only fitting that I should find myself a good passport case, n'est-ce pas? 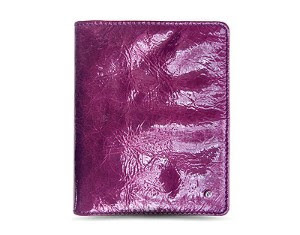 Luckily, the Hayden-Harnett Passport Multi-Function Case in Violet Crinkle Patent walked into my life just in time. Not only do I love the chicness of the distressed, crinkly, super-vibrant patent -- but it has an interior ID pocket and two big multi-purpose pockets perfect for keeping everything from the obvious passport to your money, license and credit cards. And on my Israel trip? People couldn't stop commenting on how cool it looked. The Hayden-Harnett Passport Multi-Function Case is available in multiple colors and finishes and retails for $52.